« Does Hi-Fi Audio Matter? He describes a hypothetical news service where it’s easy to customize the content so that you get the news and information that you’re interested in. 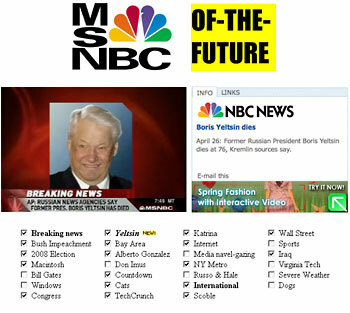 By selecting or deselecting checkboxes, you’d determine what news would show up on the page. In other words – if you’re sick of headlines about Anna Nicole Smith’s post-mortem troubles, you could de-select the Anna Nicole Smith checkbox, and you wouldn’t see any more of her. Winer’s idea for a customizable news page isn’t particularly new – just about every Internet news service offers some level of customization and collaborative filtering. But Winer’s right that the future of news needs to be easier to customize, and just plain smarter. Personalized – There should be a thumbs-up/thumbs-down option for each story, so that you can give the system feedback on whether or not you’re interested in an article. Give a couple Anna Nicole Smith articles the thumbs-down, and no more stories about who fathered Dannielynn. User-driven – Digg has showed that there’s something to be learned from the thousands of other people that use news services. Any modern news service needs to incorporate some form of collaborative filtering to help uncover niche news that may actually have broad interest. Respectful of your attention – One of the reasons that Google’s approach to Web advertising has been so successful is that it respects your attention. AdSense takes into account the content of the page it is on and the context of what readers actually click on and uses this information to display the ad that it thinks you’re most likely to be interested in. While this system is far from perfect, it’s blows away most other approaches to advertising. News systems need to be smart enough to show you the content and the ads that you’re likely to be interested in and the ads. Source-agnostic – most news systems do a poor job of integrating content from blogs, podcasts and video podcasts. Smart people want to read about the things they are interested, regardless of the news source. Instead of having to use a news site and a blog search and and iTunes to get information from various types of sources, the news service should be intelligent enough to bubble up good content from all sources. Multi-platform – an intelligent advertising system needs to be multi-platform and multimedia. People still want to read newspapers – just not newspapers that use yesterday’s technology. News organizations need to harvest information from the activity of users at their websites to create a new form of newspaper that is user-driven, customizable, personalized, source-agnostic and paid for by advertising that serves your needs. The same approach will be applied to television or video news, too. This is a tremendous opportunity for news organizations that have the resources to combine traditional news gathering with technologies like on-demand printing and video, informed with information gathered from their online presence. The Internet audience is ready for news our way – with or without Anna Nicole Smith – we’ve got money to spend – and we want it now.